These are all completed while you’re in a relevant job role. 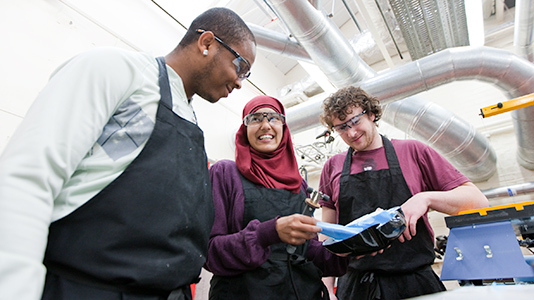 Apprenticeships are available in a range of areas, including Engineering and Business. For example, we offer an Embedded Electronic Systems Design and Development Engineer Apprenticeship, a Civil Design Engineer Apprenticeship and a Chartered Manager Apprenticeship – all of which include studying a related degree. We offer a wide range of higher and degree apprenticeships. These allow you to get a qualification, ranging from a degree to a masters or professional qualification, all while in full-time employment and getting paid. Find out more about the benefits, apprenticeship standard on offer and application process, or speak to a friendly member of our dedicated Course Enquiries Team.